This bubbled up today. He explores some choices he made in building his DIY kit in a series of blog posts on tDCS. 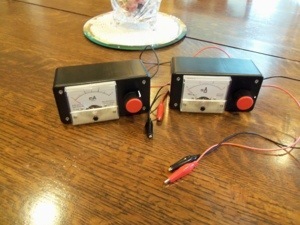 Just to see how easily it could be done, I built a couple of tDCS units for about $30 each using common parts. The meters were purchased from EBay for about $7 each and all the remaining components came from a local Radio Shack, including the case, voltage regulator, resistors, etc. The tDCS units feature a potentiometer to make it possible to adjust current for treatment specifics or pad variations. via tDCS – Building Research tDCS Units « SpeakWisdom. [Update 1/17/13] tDCS for Mood Enhancement; Stimulation Causes Euphoric Opioids. We met Anthony of GetLimitless.com, earlier on the blog. Here’s his recent YouTube update. If She Were Your Daughter – Ritalin, Adderall or tDCS? The recent PBS article Boosting Kids’ Brain Power nicely documents the work of University of Oxford’s Dr. Roi Cohen Kadosh in testing and developing protocols for improving math and learning skills with tDCS. Through interviews, PBS follows the thinking of parents exploring the possibility of using tDCS to help their kid’s difficulties with learning math. One parent compares the possible harms of tDCS vs. pharmaceutical approaches and I think this is the key question. You can listen to the piece on the article page, or download the mp3 here. Another NY Times article Risky Rise of the Good-Grade Pill points out the extent to which kids are already using pharmaceuticals, illegally, to enhance brain power. All of this points to an alarming skewing of culture and values I have no business addressing. It is easy for me to say however, that if my son or daughter were facing issues around attention or learning abilities, I’d certainly want the option of a proven, effective, and safe tDCS treatment before I’d consider a pharmaceutical approach.